Inside this 1,100 square foot cat boarding facility awaits a haven for cats only. 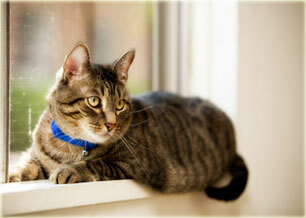 Choose from 34 bright private rooms, each with a window and viewing ledge, plush cat bed, climbing post and litter box. There are no cages. This is cat sitting at its finest. Custom built to accommodate the special needs of its cat clientele, Cat Utopia takes traditional kennel and boarding concepts to a new level. With its earth tones, spa-like atmosphere and country setting, your cats will love all the extras. state-of-the-art air exchange system eliminates odors and provides a fresh-air feel. Tile flooring and a comprehensive sanitation and sterilization process ensure a healthy environment. Stays longer than 21 days receive 10% discount; stays longer than 30 days receive 20% discount. Additional cats may share a Premium Room for $10 extra per night. Ask about our Presidential Suite. You are welcome to pick up your pet early but please call ahead and let us know that you are coming. Refunds are not available for early pick up. We require a 3 night non-refundable deposit on confirmation of reservation.